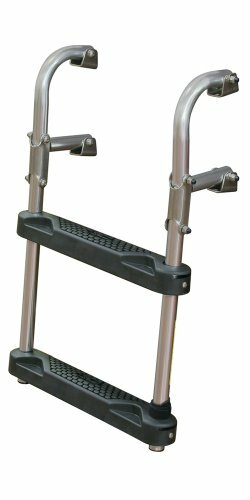 2-Step Compact Fold Down Transom Ladder is ideal for small boat transoms, requires only 12" wide x 6.5" high mounting area, including curved or angled transoms. Folds down for easy boarding. 250 lb. capacity, Length (Down): 15" Height (Up): 15" Width: 12"
If you have any questions about this product by JIF Marine, contact us by completing and submitting the form below. If you are looking for a specif part number, please include it with your message.